Lucas Oil 75W/90 Synthetic Gear Oil is a non-foaming, super slick, long lasting lubricant designed especially for heavy duty or high performance applications. This oil provides superior protection to gear components, and is available in 1 quart, 1 gallon, and 5 gallon sizes. 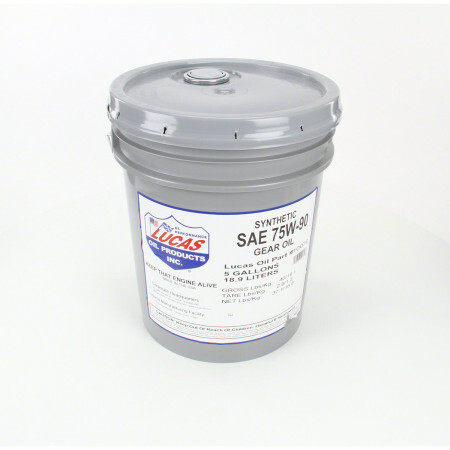 With Lucas Oil Synthetic SAE 75W-90 Gear Oil we have improved the high speed shock load and significantly improved anti-wear performance which provides the ultimate protection to the gear components. It contains a special additive package that cushions gears and resists "squeezing out" under extreme pressure situations where other gear oils don't hold up. Lucas 75W-90 Gear Oil is designed especially for heavy-duty or high performance applications and is designed to stand up to high temperatures without losing its lubricity. It is also excellent for use in limited slip differentials.